Venice Stakeholders Calls for Coastal Development Permit and Environmental Review of Beachfront Shipping Container - Yo! Venice! The Venice Stakeholders Association has filed a letter with City parks officials demanding that the City adhere to State laws in connection with the recent placement of a 30-foot long, 9 foot tall railroad transport container at Windward Plaza, within the Venice Beach Recreation Area and just steps from Venice Beach. The container is to be used to store the possessions of up to 80 people on a daily basis. The VSA letter demands that the container be removed immediately, or else the group will consider suing the City for an injunction to order its removal. I represent the Venice Stakeholders Association, a non-profit organization committed to civic improvement in the Venice neighborhood of Los Angeles. On January 15, 2013, the Department installed, on Windward Plaza in the Venice Beach Recreation Area (VBRA), a large railroad-type storage container for the purpose of regularly storing personal articles and other possessions by homeless persons and other campers living on the Venice Boardwalk and nearby streets and sidewalks. This project constitutes “development” within the Coastal Zone and thus requires the issuance of a Coastal Development Permit by both the City and the California Coastal Commission. In addition, the installation requires the preparation of an Environmental Impact Report (EIR) under the California Environmental Quality Act (CEQA). Project Description. The railroad-type storage container is approximately 6 feet wide, 9 feet tall and 30 feet long, and is constructed of corrugated metal. It is located on Windward Plaza adjacent to the Los Angeles Police Department substation, approximately in the center of the Venice Beach Recreation Area and only steps from the beach itself. 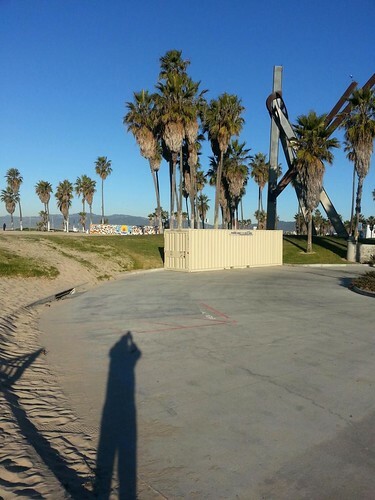 The container is significantly taller than a person, and is within open view of the beach, the Venice Boardwalk, and the grassy areas within the VBRA. Thus, it intrudes upon, and from some perspectives completely blocks, views to and from the beach. The container was installed with the express purpose of providing temporary storage for the possessions of homeless people and other campers, and reportedly will be staffed by volunteers who will check possessions in and out of the facility. City officials estimate that the storage unit will hold possessions for more than 80 persons at a time. Use of Facility by Campers at Venice Beach. Advocates for the facility claim that it will support the Westside Winter Shelter program, which provides overnight lodging at an Army National Guard Armory in Westwood, about 7 miles away from the site, by allowing users of the program to store large amounts of belongings that would not be allowed at the Armory. However, the storage facility is not restricted only to users of the Westside Winter Shelter Program. To the contrary, it can be used by any person camping at Venice Beach. In fact, there is every reason to assume that it will be used by persons who have no intention of seeking shelter at the Armory or anywhere else. Other cities with successful homeless serving programs, such as Santa Monica, have experience with such stand-alone “locker” facilities, and have avoided them because they simply enable campers to stay on the street and in public parks. Requirement of Coastal Development Permit. A Coastal Development Permit must be obtained for any “development” within the Coastal Zone, which includes Venice Beach. Public Resources Code section 30106 broadly defines “development” as including, among other things, “on land, in or under water, the placement or erection of any solid material or structure.” Courts have held that all manner of structures, no matter how small or unobtrusive, constitute “development” for purposes of the Coastal Act. See Gualala Festivals Committee v. California Coastal Com’n (2010) 183 Cal.App.4th 60, 67 (citing to LT–WR, L.L.C. v. California Coastal Comm’n. (2007) 152 Cal.App.4th 770, 776 (installation of gates with “no trespassing” signs is development); Georgia–Pacific Corp. v. California Coastal Comm’n. (1982) 132 Cal.App.3d 678 (security fence met definition of “development” in Public Resources Code section 30106 because it “involve[d] the ‘erection’ of a ‘structure’ on ‘land,’ or the ‘construction’ of a ‘structure,’ or both.”). Without question, the placement of a large corrugated metal container right in the midst of the Venice Beach Recreation Area is “development” under the Coastal Act. Accordingly a Coastal Development Permit should have been obtained beforehand. Moreover, because the City does not have a land use plan (LUP) certified by the Coastal Commission, development in this zone requires a Coastal Development Permit from both the City and the Coastal Commission. Significant Scenic Impacts. The storage locker has a significant impact on scenic resources. It is made of corrugated metal and just steps from Venice Beach, in the midst of a City park which presently contains very few structures. It intrudes upon, and from some perspectives completely blocks, views of the ocean now enjoyed by millions of visitors and residents. Lack of Mitigation. There has been no attempt to mitigate the significant visual and other impacts of this metal storage locker in the middle of the VBRA. The facility is in open view of the millions of people who visit Venice Beach each year. Nor is any such mitigation possible. Any attempt to conceal the structure would require the installation of another structure or improvement that would also block views to and from the beach. No Mitigated Negative Declaration Under CEQA. A mitigated negative declaration under CEQA is precluded because potentially significant scenic impacts of the project either would not be, or could not be, mitigated below a level of significance. Thus, an Environmental Impact Report must be prepared in order to satisfy CEQA. For all of the foregoing reasons, a Coastal Development Permit must be obtained and an Environmental Impact Report must be prepared for the installation of the storage locker. Accordingly, we request that the Department immediately remove this storage locker and, if it wishes to pursue the installation of such a facility in the future, comply fully with both the Coastal Act and the California Environmental Quality Act. In the event that you fail to remove this structure, VSA will consider filing a petition in the Los Angeles Superior Court for an injunction mandating its immediate removal. The Venice Stakeholders Association is dedicated to civic improvement. The VSA supports slow growth, protection of the limits of the Venice Specific Plan, neighborhood safety, better traffic circulation, increased parking for residents, neighborhood beautification projects, historic preservation, habitat restoration and protection of coastal waters.